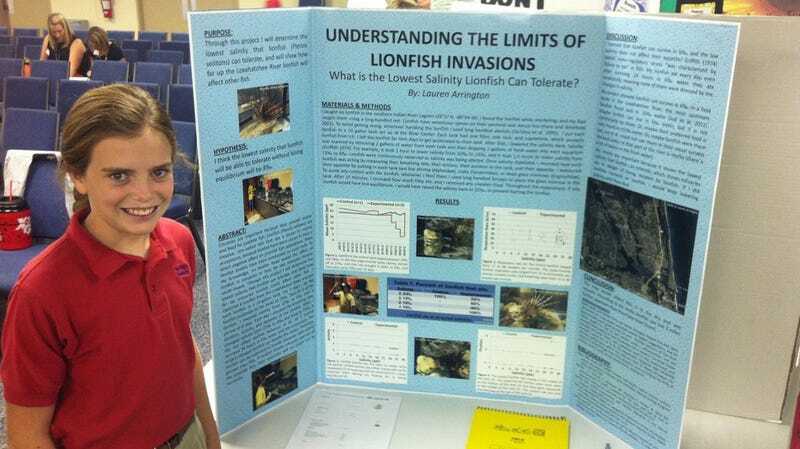 By showing that lionfish can live in fresh water, 12 year-old Lauren Arrington has alerted ecologists to the potential for these fish to migrate upstream in rivers where they would pose a threat to the ecosystem. The invasive species, which can be found along the Florida coast, has only been studied in saline, ocean-like conditions. "It was just a small, sixth-grade project, and I really didn't have all the tools necessary," she says. Her dad, who has a Ph.D. in fish ecology, suggested that she put the fish in tanks instead. Lauren then put six different lionfish in six different tanks where she could watch her subjects closely. Lauren was given a strict set of rules by the science fair organizers. The most important one: Her fish could not die. Lionfish had been found to live in water with salt levels of 20 parts per thousand. But no one knew that they could live in water salinity below that. One of the six lionfish was her control fish, and the rest were the experimental fish. Every night for eight days, she would lower the salinity 5 parts per thousand in the experimental tanks. On the eighth day of her experiment, she found her experimental fish were living at 6 parts per thousand. She was amazed. This suggests that lionfish — who have no natural predators in the region— could migrate upstream and mess-up the ecosystem. Inspired by this project, North Carolina State University's Craig Laymann published an article in the journal Environmental Biology of Fishes. The ongoing invasion of non-native Indo-Pacific lionfish (Pterois spp.) represents a significant ecological threat throughout the Western Atlantic and Caribbean. As a generalist species, lionfish have been able to rapidly colonize a wide variety of ecosystems, including coral reefs, seagrass beds, mangroves, the sea floor at depths as great as 300 m, and even brackish estuaries. It should be noted that Laymann mentioned Lauren in the acknowledgements. Sheesh — sounds to me like he could have gone so far to list her as co-author. Image: Lauren Arrington via NPR.